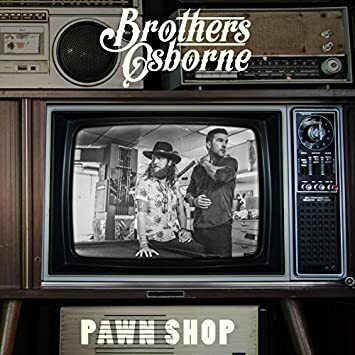 Already a highly popular name within country music, the reigning CMA Vocal Duo of the Year Brothers Osborne are set to see their major-label debut album Pawn Shop formally released in the UK on March 10th in preparation for their appearance at this year's C2C Festival. With a distinctive Americana sound, the duo craft a strong identity through an album that is sure to intrigue new listeners and has already won them a considerable fan base. In the only collaboration on the album, Lee Ann Womack joins the duo for Loving Me Back. Set against a waltz timing, the interesting dynamic between the distinctive voices works very well and it is the instances where Lee Ann vocals can be heard where the track really shines. Arguably a brave inclusion on the album, Loving Me Back's characterful sound may alienate some listeners however this is certainly a track that should be embraced in my opinion. The only frustrating part of the track is that there is one particular point where you think there is about to be a short a cappella section (this doesn't happen) which would have been a great added dynamic to an already strong track. Perhaps we may see this in future releases as Brothers Osborne grow in confidence and solidify their fan base. In complete contrast to Loving Me Back, following track American Crazy is a track that would sound just as at home on a album from an artist like Jake Owen. As soon as the first chorus starts you instantly feel like this would be an incredibly popular track within a live performance with it's catchy lyrics and appealing production. There are a couple of unnecessary almost spoken lyric sections but other than that American Crazy is a well-rounded and very listenable track. If you look deeper into the lyrics behind the song you will notice that much of the focus seems to be on a heavily repeated chorus however this doesn't actually take away from the overall experience - one you can happily come back to again and again! Whilst there are some strong moments here, I don't feel as though I've been entirely won over. It is clear that Brothers Osborne have already developed their 'sound' however there are some parts of the album that feel a little uncomfortable. Title track Pawn Shop for instance channels an intriguing steampunk sound but it ultimately just comes across a little awkwardly. As with American Crazy it seems as though much of the track's focus is on the chorus however, inversely, that repetition is obvious here and leaves the listener feeling a little bored and questioning the lyrical appeal. I have seen multiple people liken Greener Pastures to something we would expect to hear released by Kacey Musgraves and, whilst I can certainly see the resemblance, what sticks out here is that it doesn't really suit the duo. It's a shame as I quite like the lyrics but I do feel as though the song as a whole would have been better with a different instrumental line as the basis to the production ultimately ends up feeling a little annoying. Pawn Shop is, in my opinion, a mixed bag of an album. It has already been embraced by a considerable audience and garnered Brothers Osborne a lot of support however it hasn't completely made me a fan of theirs. Most likely to appeal to staunch fans of Americana than fans of other aspects of country music, there is clearly an opening for them and even though it is an album I won't be regularly returning to I still wouldn't warn anyone off listening to the album. Labels: Brothers Osborne "Pawn Shop"